Hoarding has not only become a popular topic for media coverage, it's also a trending topic in the insurance industry. Because it's more prevalent in our society today, Jenny Bischoff senior personal lines underwriter will explain the practice of hoarding and how it affects insurance coverage and claims. 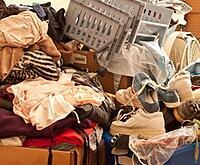 Approximately 1 in 20 Americans have hoarding tendencies. There are five levels of hoarding. They range from Level One where clutter isn't excessive and all doors and stairways are still accessible, to Level Five where clutter is excessive, multiple appliances are broken, and the home has even suffered structural damage. Many people collect things and having a large collection that's properly stored and/or displayed isn't hoarding. Like collectors, hoarders keep things that are important to them. The difference is that the items hoarders collect typically have no value and they collect excessive amounts. With only so much space in the home, accumulation often leads to losing access to such areas as stairs and exits. Hoarders also stop inviting family and friends over and generally won't allow anyone inside. Some of the risks associated with homes occupied by hoarders include water damage, mold growth, structural damage, and increased trip and fall hazards. Let's review a few different scenarios of serious situations that could cause loss to the property, to those living inside, and to others who enter the home. Fire Risk. When a home has become so filled with possessions that there's no access to exits and stairs, there's a real risk of death should a fire start in the home. Occupants won't be able to easily escape. First responders won't be unable to locate people and animals to help them get out; blocked exits and stairs also increase the risk to their own safety. Water Damage. If there's a leak in the kitchen, but the kitchen is so filled with "stuff," the inhabitants can't see where the water's accumulating. This could result in a large claim for water damage to the home, as well as to the insured’s possessions. It could also eventually lead to mold growth. Even if the hoarder knows a plumbing issue exists -- and where -- they typically won't call a plumber to fix the problem because they don't want anyone in the home. This could mean plumbing problems go unfixed for so long, the facilities in the home (bathrooms, kitchen, etc.) become unusable. Structural Damage. Sometimes a hoarder has such a huge accumulation of belongings, the home can no longer bear the weight and this leads to structural damage. Fall Hazards. The number of items in the home, and the way they're stored, can create an increased liability risk of trip and fall hazards. In addition, a pile of "stuff" could fall on top of the inhabitants or visitors. When an insurance carrier is made aware of a hoarding issue, the underwriter will typically decide to stop providing coverage. The liability, fire, mold, and water damage risks associated with hoarding are reason enough, but the bigger issue is that there's no easy or quick fix. A hoarder may be able to get the home cleaned up enough that it appears insurable, but for how long?